Apple has released new beta versions of iOS 10, macOS Sierra 10.12, tvOS, and watchOS. The new beta builds are available now for users who are running either the developer beta or public beta. 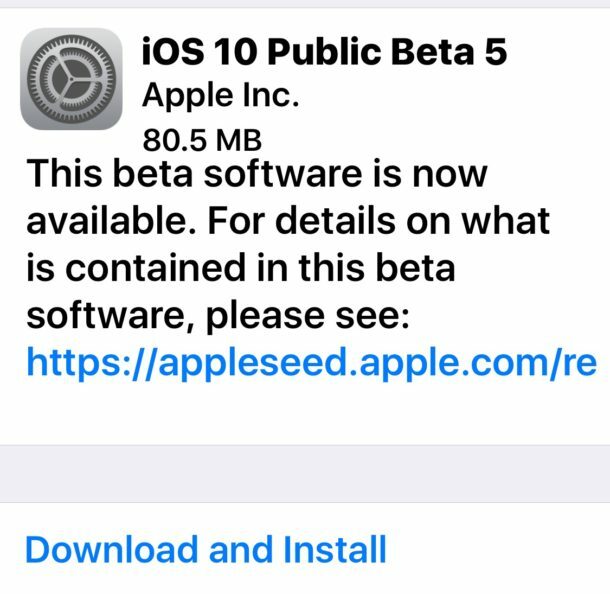 For iOS 10, the latest beta release is versioned as Developer Beta 6 and iOS 10 Public Beta 5 respectively, both of which are available now from the OTA update mechanism within the Settings app. The latest watchOS 3 beta 6 and tvOS 10 beta 6 can also be downloaded through their respective Settings apps using the over-the-air mechanism as well. The most recent beta build of macOS Sierra 10.12 can be downloaded through the Updates section of the Mac App Store as usual. Anyone can choose to install iOS 10 public beta and install macOS Sierra public beta, but beta software is notoriously less reliable and frequently buggy, which should limit the beta testing experience to more advanced users who have thorough backups and preferably are installing the releases on secondary hardware. The final versions of iOS 10, macOS Sierra, watchOS 3, and tvOS 10 are set to be released this fall. Typically Apple releases the final version of system software during their fall iPhone event, suggesting that we could be seeing the new system software available to the general public sometime around early to mid September. The latest OS x beta totally bricked my computer. I am done with Apple and their garbage and going back to my Little Tots PC. Beta software is often unreliable. Perhaps you should wait until the final version comes out in September or October. I typically recommend waiting for the first point release. That would be Mac OS 10.12.1, maybe available by the holidays. I am unable to get the last update. I don’t know whats up with iTunes. It says the update is ready, and when I press install it says it is failed to verify the update. Same thing is happening from last one week and there is new update released. I recently updated to iOS 10 Beta 6. Honestly the experience has been awesome. Lot of stability I can see, still early in the day but happy to have gone for it. I don’t mean to be rude but anyone who downloads a beta OS to their working daily workstation and then says it got bricked, and therefore is leaving Apple for MS is either trolling or is technology challenged. 1) There’s no such thing as “bricking” a Mac. Boot up from your Recovery Partition or a USB Recovery Partition and reinstall the last backup which OF COURSE you made before you installed the beta OS. Fixed. 2) Apple releases OS betas to collect data from users. Unless you have a spare hard drive, partition or another Mac, NEVER INSTALL A BETA OS! 3) Become proficient in troubleshooting. Learn as many GUI based and Terminal based troubleshooting techniques before installing betas. 4) OS X (macOS) isn’t garbage. Like Chockinsmith said. If you use your Mac for serious work (income, content creation, etc..), think like an IT admin and wait for a 10.x.1 release. I might go further to a .3 or .4 release. Once you have the perfect balance of CPU, RAM and flash drives, and then apps and OS, LOCK DOWN YOUR SYSTEM AND DON’T UPGRADE ANYTHING until the next upgrade cycle (set by you or the developer of the main app you use for your work). Advice courtesy of a former Apple employee. Currently running both Beta’s on iPhone & Air and only experience spinning rainbow on Air which is a waiting game but patience in testing software is mandatory. Only “confused” my iPhone once but Apples recovery and backup software to include process is 5 Star!! Maybe I have just been lucky, but the latest OS beta installed without issues at the moment. The only thing I really loved was the background images and Fireworks displays with the new texting features and now since like beta 3 it went away and I have been able to use it since.. Sad.. :( The option doesn’t even pop up anymore.. But other then that my phones been fine. Given I know you can restore it as well but I have a back up of my phone on my laptop on I tunes so Im not that worried..